Nicholas Dunn is the winner of the Twitter daily tip giveaway. 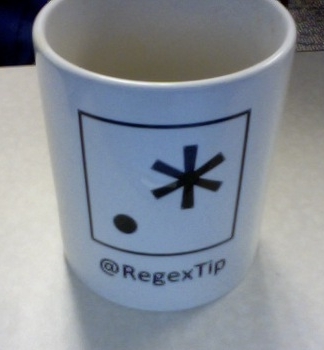 A coveted RegexTip coffee mug is on its way. Update (5 May 2010): Nick posted a photo of his mug. I ran some statistics on the daily tip sites. The full data are available here. There are 1406 unique followers across the seven daily tip accounts. There are 2572 followers if you count multiple follows. Most of the patterns in the data were predictable. For example, people who follow one math account are likely to follow another math account. But those who follow SansMouse for Windows keyboard shortcuts are not so interested in the math accounts. Here’s one surprise: 84% of TopologyFact followers also follow AlgebraFact, but only 31% of AlgebraFact followers follow TopologyFact. This may be in part because TopologyFact is newer; I suspect those who follower the newer accounts are more aware of the older accounts than vice versa. Here’s the full list of my daily tip accounts. Regarding algebra and topology, my experience is that most topologists use algebraic tools, but topology is much less frequently used to obtain algebraic results. I was actually thinking of attributing the difference between algebra and topology to likely senario that most people don’t know what topology is, while most people know what algebra is, and know they need to be better at it. Well, I haven’t been following the twitter account, but I’m guessing that this is not the algebra that most know. Probably groups, rings, fields, modules, etc.